Q: What is seborrheic keratosis? 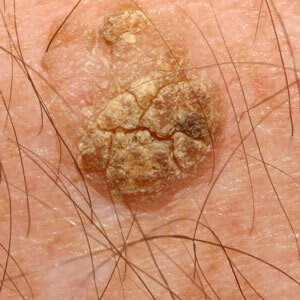 Seborrheic keratosis is a type of skin growth that usually appears in the back, shoulders, face or chest. It has a black, brown or light tan colour and has an elevated, scaly and waxy appearance. There are cases where one single growth appears, and there are cases where multiples growths appear. Seborrheic keratosis is essentially the most common noncancerous type of skin growth. Q: Are you likely to get seborrheic keratosis? Everyone is at risk, and most common risk factors include old age (mostly individuals over 40), relatives with seborrheic keratosis and frequent sun exposure. Q: Does seborrheic keratosis pose any health risks? There are no health risks associated with seborrheic keratosis; it’s a harmless growth. People tend to have them removed for aesthetic reasons. Q: How do you remove seborrheic keratosis? Seborrheic keratosis growths are usually removed in one of two ways: with cryosurgery or with electro surgery. In the first case, the growth is frozen with the use of liquid nitrogen, and in the second case it is scraped off with an electrical current.